Rudolph Amandus Philippi was born in Charlottenburg (now a quarter of Berlin), on the 14th September 1808. 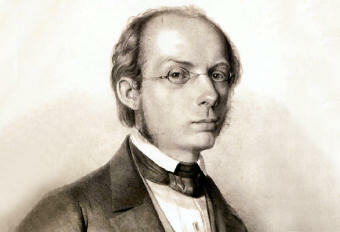 After his studies in Switzerland, Philippi went back to Germany where he obtained a medical degree. During the first voyage to Southern Italy (1830-1831) he developed a great, life-long passion to natural history. In Italy he studied the distribution of vegetation on Mount Etna and collected fossil and living molluscs. He went again to Italy in 1837, to recover from tuberculosis. For the two volumes of Enumeratio Molluscorum Siciliae, published in Germany in 1836 and 1844, Philippi received a gold medal from the Prussian King. In Kassel he taught at the Gewerbeschule (Polytechnic School) and was one of the founders in 1836 of the Vereins für Naturkunde zu Kassel (Natural History Society of Kassel), of which he was president up to 1850. This society will give origin to the Philippi-Gesellschaft (Philippi Society). Philippi also held public position but was persecuted because of his republican and liberal ideals. 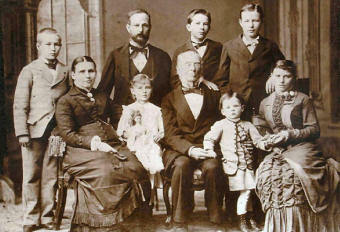 In 1850 he sailed from Hamburg on board of "Bonito", to reach his brother Bernhard Eunom in Chile. After the death of his brother, Rudolph Amandus moved from Valparaiso to Santiago, where he was professor of botany and zoology at the University and director of the Natural History Museum. Philippi’s scientific production is enormous: some 400 works, ranging from botany (with the description of about 3000 new species), to zoology (molluscs, insects, vertebrates), geology and ethnography. He explored the Atacama Desert, reorganized the Natural History Museum in Santiago and founded the Botanical Garden. Rudolph Amandus Philippi died in Santiago, on the 24th July 1904. Philippi used non-metric measurements based on the foot unit and its submultiples, inches ('') and lines ('''). There were two main systems, French and English, with small differences. Many thanks to Eberhard Schrader for biographic and bibliographic informations about Philippi, Ingrid Rimbach, who kindly sent a CD-Rom with the fine posters used for an exhibition on Philippi at the Naturkundemusuem im Ottoneum in 2004, Daniell Haug for translations from Germany and Alessandro Guastella for his a valuable technical support.